Chapter 4: The Nevada Conference. On a whim I attended a conference in Laughlin, Nevada, in August of 2001, given by Kronia, the organization with a website (since disappeared) of the same name, organized by David Talbott and others. The conference dealt with aspects of the Saturnian Polar Configuration expanded on in these pages. I was familiar with the work of Immanuel Velikovsky, and the subsequent work by David Talbott. Velikovsky, in Worlds in Collision (1950), described how Venus interacted with Earth in 1492 BC. Talbott, in The Saturn Myth (1980), established that, in a more remote era, a large globe had stood above the Earth at the north horizon. Talbott's book is overwhelming in detail, and convincing in its thesis (even though he would interpret some details differently today). The conference also brought out information by Wal Thornhill on plasma in the Universe as I have noted earlier. Others in attendance were Don Scott, Dwardu Cardona, Anthony Peratt, and Rens van der Sluijs. I came away from the conference unsatisfied. There was no cohesive chronology put forth, and the mechanics of an intersection of Saturn and the Solar System lacked elegance. I decided to start this text (as web pages) in an effort to put things in order and to develop a cohesive chronology. However, initially the lack of an adequate model of the celestial mechanics was an obstacle. After the conference I wrote up the information I had available (September of 2001) and then the site lingered as I repeatedly got stuck. I backed up to study a few things. I had no problem with the plasma theories (I'm an electrical engineer). What was missing were concepts and data from other disciplines. I needed a broader base to work from, and ended up spending time reading or rereading biology, evolution, geology, and archaeology. I read books supporting orthodoxy as well as books at the edge of speculation. By mid-2003, I knew that many of the statements I had made were not supportable and that a new explication was needed. What needed to be reinvestigated was the idea that Saturn, together with Earth, could enter the Solar System in about 3000 BC and end up in a circular path in a matter of 300 years. That just didn't make sense. I started rewriting in February of 2004, and finished in draft form a year and a month later, March 2005. Now, in the spring of 2014, I see that additions, word edits, and data tweaks have continued for nine more years. Objects that enter the Solar System don't start on circular paths; they travel on extremely elliptical paths. The comets bear witness. Circularization will happen eventually, but it might take millions of years. Earth needed a tilted axis with respect to its orbit to account for a persistent ice cover at the poles, extending back 30 million years. That would not have been possible if the Earth had been part of the Saturnian System until 3400 BC, under the condition of being an equatorial satellite. In fact, it looked as if Earth has experienced seasons for a very long time, at least 200 million years, and therefore Earth, with its tilted axis, had to have rotated about the Sun at least that long. A tilted axis would not be at all likely for Earth as a satellite of Saturn. Also, I could not initially imagine how Earth might have ended up suspended below the south pole of Saturn -- especially as an initial condition. Planets "left behind in the wake" is just absurd. I juggled these problem areas simultaneously, often falling asleep imagining Saturnian orbits and Earth conditions. I'll address the problems below. If Saturn were to be introduced into the Solar System, it would be because of the gravitational attraction of the Sun. Saturn would enter on a comet's path, headed straight to the Sun, like all comets, swing tightly around the Sun, and disappear again into the far reaches of space. But Thornhill and Talbott have Saturn entering the Solar System only once. This absurdity violates Newtonian celestial mechanics. Last, it would not matter from which direction the Saturnian System first approached the Solar System. Over time, Saturn would have leveled its orbit to the ecliptic due to gravitational interactions with the Sun's planets. This is especially true if, as I will show later, Jupiter was probably located at 0.7 AU, and would have gravitationally changed Saturn's wild orbit whenever Saturn closed in on the Sun. Additionally, the planets Earth and Mars traveling with Saturn as it first approached the Solar System -- 500 million years ago -- would have rotated at the equator of Saturn, as do the planets of the Sun, and as do the satellites of all the planets -- not below the Saturnian south pole. With Saturn on an orbit which always turned close to the Sun at each approach, a satellite orbiting Saturn would have a good chance of switching orbits and being lost to the Sun, that is, going into a Solar orbit. For Earth this seems to have happened about 200 million years ago, after the Permian. Thus, as my new starting point, I assumed that the Saturnian System intersected with the Solar System at some point in the remote past with a number of planets -- Earth and Mars, at least, and perhaps others -- as satellites on equatorial orbits around Saturn. Some satellites were lost to the Sun, to rotate independently as planets of the Sun. It is likely that this happened over a very long period of time, enough time, in fact, so that Saturnian planets would end up on orbits flattened to the equator of the Sun. I initially wanted to account for the ice, following Immanuel Velikovsky's suggestion, with the heat generated by a shifting lithosphere. His suggestion, however, was based on a "close passage" by Venus. Under this imagined condition the lithosphere would be expected to crack, bulge, and split open, and the heat generated would cause evaporation of oceanic water to the point of saturating the atmosphere. The saturated atmosphere would cause endless rains, but somehow limited to Greenland and North America. This didn't make sense, although Velikovsky's suggestion actually made much more sense than many other theories, as, for example, basing northern glaciation on the fact that it snows constantly at the North Pole (it does not), or invoking Milankovitch's cycles of changing global temperatures (but cold temperatures do not make glaciers), or the long-term changes in the Sun's sun-spot cycle. None of these causes hold up. I had much less of a problem with Velikovsky's suggestion than with these other theories and I allowed it to stand as a possibility. Perhaps, as he suggested, gravitational forces could wrench the Earth's lithosphere when Saturn came to perihelion with the Sun. But there were some drawbacks to this theory which continued to nag at me. For one thing, polar glacial ice is not frozen rain -- it is compacted snow. Additionally, northern Asia has never been glaciated, even though it is clearly within the Arctic Circle just like Greenland. The seasonal plants and even the diurnal habits of nearly all the animals on Earth argue against the Earth having been below the south pole of Saturn up until very recent times (as Thornhill suggested), or having always existed within Saturn's coronal glow discharge envelope where there would be no difference between night and day (as Cardona suggested). The Earth might have been a satellite of Saturn at one time, but most likely that relationship had ended a long time ago. How long ago? Talbott at one time suggested the Eocene, 50 to 60 mya (million years ago). The Eocene makes some sense. It is the age of the expansion of mammals, the spread of grasses, and the takeover of modern plants -- all seemingly dependent on seasons. It also falls after the K/T boundary -- the "giant meteor impact" in the Yucatan, 63 million years ago, which marked the eventual demise of the dinosaurs and the end of the Cretaceous period. This certainly represents the end of a biological era for Earth. The earlier plant cover of the Earth (the Carboniferous, 345 to 300 mya) consisted of slow-growing, heavily armored, and hard (siliciferous) plants. Pine trees (gymnosperms), which date from after that era (the Jurassic, 200 to 140 mya), even today take three years to come to seed, and without flowers. A later period (the Cretaceous, 140 to 65 mya) saw the development and spread of fast-growing, soft-bodied, seasonal flowering plants. Although the end of the Cretaceous, 65 million years ago, might be suggested as a division between two biologically distinct periods, this is not early enough. I am suggesting, therefore, that at the end of the Permian, Earth was still orbiting Saturn; the Earth would have had no seasons, since the Earth's rotational axis would have been parallel to Saturn's axis of rotation. At the time of the Permian extinction, the largest extinction ever, 99 percent of all aquatic species disappeared and 95 percent of land species. This was accompanied with equatorial glaciers. It is this last, plus the extreme (and inexplicable) nature of this extinction which suggests that Earth would still have been on an equatorial orbit with Saturn at the end of the Permian. The Permian had produced the forerunners of both dinosaurs and mammals. The close of the Permian is marked by a drying of inland seas, equatorial glaciation, and mountain building (the Appalachians and proto-Rockies). Current thinking is that the land extinctions of the Permian were caused by massive lava flows which happened in Siberia, accompanied by increased carbon dioxide and methane gases. As the methane oxidized (along with organic material from the lowered inland seas), carbon dioxide increased even further and oxygen levels dropped. But these particulars are not at all certain. Some seven lifeless layers of sediment (wind-blown sand and dust) follow each other at the end of the Permian. This is today visible in South Africa's Karoo Desert. Today these layers are estimated to span 100,000 years, but this time span is based on guesses at the sedimentation rates. I doubt if all of it extended over more than a period of a few thousand years. The Permian depositions of material and extinctions were perhaps serial but they were rapid. The extinctions at the end of the Permian were not the result of a single, or occasional plasma contact with Saturn, but the result, I would guess, of a nova event. At this point, harking back to the earlier concept (by Velikovsky) of the possible jolting of the Earth in the periodic visits of Saturn to the Sun, I realized that the frequent and periodic extinctions of the Paleozoic (the period since the Cambrian) might be due to more than just geological upheavals. If Saturn's occasional return to the Sun were to have a worldwide impact on the Earth, there had to be some mechanism to account for it, other than possible geological disturbances. Mountain building, or the draining of inland seas, is extremely slow from a biological point of view. Biological organisms will adapt during the millions of years that it takes to raise mountains (if mountain building indeed takes millions of years). What was needed to explain the extinctions was a more sudden cataclysmic event. It would not matter if Earth were still a satellite of Saturn, or had become a planet orbiting the Sun. The plasma discharges of Saturn, as it neared perihelion with the Sun, would affect Earth in either case. In fact, the lightning discharges would probably start when Saturn, with Earth as a satellite, initially crossed the boundary of the Sun's plasmasphere (heliopause) at a distance of about 100 AU from the Sun, and would continue until Saturn again exited. During this time Saturn would have blazed through the skies not unlike a comet, but considerably different and much more compact. This assumes, as the reader can see, that I am suggesting a very long period for Saturn. During any of the later near approaches of Saturn, after the Permian, the Earth would likely have been displaced to a new orbit, depending on how the two planets approached each other. The new orbit would have had a major effect on the climate. In fact, the biological record indicates that Earth experienced extreme changes in climate, in each case lasting tens of millions of years following each extinction event. These concepts might be the answer to the "Planet X" theory, which suggests that an unknown planet of very long period caused the mass extinctions of life on Earth at 27,000,000-year intervals since the Cambrian, 560,000,000 years ago. 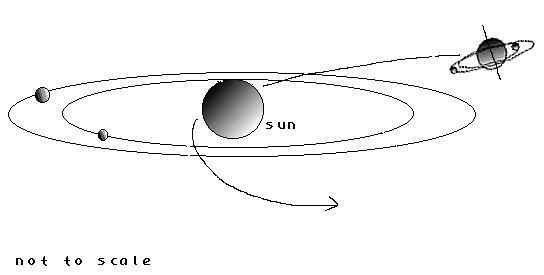 It has been suggested that Planet X would travel at a right angle to the equator of the Sun, that is, circumpolar, since nothing like Planet X has been found in the ecliptic. Most likely "Planet X" was Saturn, and not on a circumpolar orbit but on or near the ecliptic. The extinctions would be caused by changes in climatic conditions coupled with X-rays, UV radiation, and Gamma rays (high-energy photons) lasting for tens of thousands of years. Plasma discharges would certainly be to blame for the last. Lastly, as I mentioned, I could not accept the postulate of the Earth located below the south pole of Saturn as an a priori condition. Nothing in all our experience with the paths of planets or satellites indicates that this would be remotely possible as an initial condition at any time in the past. Secondaries revolve around their primaries at the equator of the primaries, they do not hang suspended sub-polar. Yet, I would have to accept the sub-polar configuration at least as a required condition at some later time, for all of the Saturn imagery describes this. The possibility of Earth being recaptured by Saturn as a satellite is virtually nil. Capture requires a forward motion which not only matches the passing planet, but requires passage on the outward side of the capturing planet (away from the Sun), and then a sudden change in direction and dramatic change in speed to become a satellite. If a planet were to meet Saturn equatorially the planet might be moved electrically into a larger or smaller Solar orbit. It would not end up orbiting Saturn as a satellite. But if Saturn and another planet could override each other, placing one above the other (which could easily happen because the orbits of all the planets are tilted at different angles), this would be an entirely different condition. This would not change the orbits around the Sun of either Saturn or the planet. They would ride the path around the Sun together. Tom Van Flandern defines a "gravitational sphere of influence" for planets. The "gravitational sphere of influence" is the region surrounding a planet where a potential satellite would remain to travel with the parent planet, if the speed of travel were within a certain range. Otherwise the satellite would either escape or crash to the planet (as Van Flandern has it). For Saturn the "gravitational sphere of influence" would be reduced as Saturn closed in on the Sun on its elliptical orbit. But the gravitational sphere of influence is a second order effect. The primary effect is a clash of the electric fields of the two planets after their plasmaspheres are breached. The meeting of planetary plasmaspheres can occur under certain conditions, and the results vary. I will describe these as needed in the narrative. Earth, Mars, and Neptune were all planets (satellites) of the star Saturn, and had been orbiting Saturn for billions of years since their creation when, shortly before the Cambrian, 560 million years ago, Saturn intersected with the Solar System -- perhaps for the first time. Saturn swept around the Sun like a comet, to return every 26,000,000 or 27,000,000 years, still with the original planets in tow, that is, as equatorial satellites. Over time, some of Saturn's planets were captured by the Sun. This happened to Earth after the Permian, 250 million years ago. This could only happen to Saturnian satellites on prograde orbits around Saturn. At this point it should be made clear that the ability of Saturn to attract other planets, especially the inner planets, has to be the result of Saturn entering the Solar System with an exceedingly high positive charge. It could also be suggested that Earth may have been captured and released a number of times in the last few million years. Over a much longer period of time, extinctions were most likely caused by electric field attractive or repulsive forces which changed the Earth's orbit plus massive electric discharges (arcing) from Saturn, perhaps only as Saturn reached perihelion with the Sun. Saturn may have been responsible for all the speciation after the Cambrian, and especially the complex species which have developed since that time. Speciation probably took place during or after every extinction period, although it might have taken many thousands of years before new species stabilized and would show up in the record. The fact that Saturn was never deflected by the Solar System planet Jupiter would be explained by the fact that in 560,000,000 years Saturn would have entered the Solar System only 19 or 20 times. Once the period of Saturn was significantly reduced (6 or 3 million years ago) it would have come closer to the Sun more frequently (of which we have both physical and written records), smaller planets of the Sun would then have a greater chance of being captured into a sub-polar or supra-polar orbit by Saturn (the Moon was never captured). In fact, it would be likely that over time all the smaller inner planets would have been captured in this manner. Only planets further away from the Sun would be safe from this because they would be less likely to encounter Saturn. With the above list as a starting point, I could proceed to visualize the interaction of Saturn and Earth after 10,900 BC, and have some confidence of being on the right path toward a connected narrative. At the same time a 4-billion-year vista of the past suddenly opened up. I hope the reader will understand that what is presented here is conjecture, although it is supported by a very large measure of common sense and by concepts which have only come into more general awareness in the last decade. Although for the most part we know next to nothing about the specifics, it should now be possible to chart a course of likely events and probable dynamics which matches the sparse information we have. The new element added to the normal planetary dynamics is, of course, the part played by planetary plasmaspheres, electric field forces when these intersect, and the attendant electric discharges. What I will attempt to do in the following chapters is to plot the progression of changes for the planets of the early Solar System, using the simplest and most likely explanation which makes the case at any point and sets the stage for following events. This removes much of the inexplicable "changes in orbits" for which the catastrophism of Velikovsky has been faulted. I hope to bring the story back to the normal expected interactions between the planets of a star. In fact, most of the events after 3147 BC reduce to a series of small changes in a set of nearly identical orbits of two groups of two planets, Mercury and Mars, and Venus and Earth -- but generally at very long intervals. In this chapter I have hinted at the 500-million-year long history of the repeated interactions of Saturn with the Solar System. In the next chapters I will show that Saturn probably was the cause of the development of higher life on this planet, and in subsequent chapters tell how our remote ancestors experienced Saturn in the skies above Earth -- and recorded this in the Americas, probably since 41,000 BC. This information would set the stage for the eventual capture of Earth to below the south pole of Saturn. I will address this period, which started in about 10,900 BC, a few chapters hence. Looking forward, the following will be discussed more or less in order. 10,900 BC - Shock in North America, fire, demise of megafauna, creation of the Great Lakes, 1500 years of shadow, 225-day year. Start of the Peratt plasmoids in the south. 8347 BC - End of the period of the plasmoids. 5800 BC - Black Sea flood. 4077 BC - Saturn lights up. 3147 BC - World flood, Jupiter on a steep mountain, 240-day year. 3067 BC - 2750 BC - Mars (with Mercury) closes in on Earth 10 times. 2860 BC - Jupiter enter the asteroid belt, loses its mountain form. 2349 BC, September 8 - Contact by Venus, fall of the Absu, appearance of the Moon, 260-day year. 2193 BC - Contact by Venus, 200 years of drought, 273-day year. 2150 BC - Jupiter catches on fire. 1936 BC - Contacts by Mars, Sodom and Gomorrah destroyed. 1492 BC, April 19 - Disturbances by Venus (Typhon), Exodus, 20 years of cloud cover, 360-day year, axial inclination to 30 degrees. 1442 BC - The sun stands still for Joshua (Venus). 806 BC - 687 BC - Nine Mars contacts. 776 BC, February - Mars, Venus, Mercury ballgame. 747 BC, February 27 - Mars jars Earth. 365.25-day year. 686 BC, March 23 - Mercury jars Earth, second Tower of Babel. 685 BC, June 15 - Venus and Mercury (Phaethon) start to blaze. 685 BC, July 9 - Jupiter wakes from death. 685 BC, July 14 - Jupiter releases a plasmoid bolt. 685 BC, July 25 - Plasmoid bolt lands at the Sun. 685 BC - Earth's axial inclination changes. 684 BC - A new Great Year starts March 8th (old equinox date). AD 600 - 800 - Red ring of the Absu fades. AD 1700 - Last sprinkling of Absu dust. AD 1840 - Ecliptic pathway last seen. Don't let anyone suggest that the recent history of the Earth has been one of a few simple transitions. It is a miracle that we humans survived at all. The single-entry corkscrew idea was reiterated (to me) by the Saturnian people (of Thunderbolts.info) as late as summer of 2007. In the 2007 book by Wallace Thornhill and David Talbott, The Electric Universe, there is an illustration of circular and spiraling magnetic lines, shaped like a funnel, located above (and below) the axis of the Solar System, with the Sun as the main focus (attributed to S. T. Zuess, 1999). The magnetic lines spiral toward the Sun, and are reminiscent of the proposed spiral (corkscrew) path taken by Saturn on approaching the Solar System (from below the Sun). But there the analogy stops. A book illustration is no basis for insisting on a spiral approach path for a planet. This also contradicts well-established gravitational mechanics. Comets elevated above the ecliptic do not spiral into the poles of the Sun. Dwardu Cardona, in a series of four books (see the Appendix "Book List"), also maintains the thesis of a single entry of Saturn (with Mars and Earth in tow) into the Solar System. I am assuming that all of Saturn's satellites also rotated about Saturn in a prograde direction (counter clockwise as seen from above its North Pole), as they do today. The prograde direction of Saturn's travel around the Sun is probably critical, because a satellite circling Saturn would describe an epicycloidal path in moving around the Sun with Saturn, making it look as if at some point it were standing still. The "stand-still" nodes for this path are located between the passing Saturn and the Sun. And, in fact, at these locations, the satellite would still have the forward speed of Saturn, appropriate for a new orbit around the Sun at that location, but reduced somewhat by the orbital speed of the satellite in the reverse direction around its planet. If the satellites of Saturn had rotated retrograde, the stand-still nodes would be placed on the outside of the orbit of Saturn. There are of course two additional possibilities, based on an initial orbit of Saturn in a retrograde direction around the Sun. Today we see very little "flattening" of orbits. This can be blamed on the wide dispersal of the planets, in effect minimizing their gravitational interactions. But as long as Jupiter remained within the realm of the inner planets (before 3147 BC) there would have been much greater gravitational interactions. Thus it is likely that during this earlier period the orbits of the inner planets (plus Neptune) were flattened to the equator of the Sun, or, more likely, to the orbit of Jupiter. This could have extended back 500 million years for some planets. Ice cores in Greenland only show a series of about 120 thousand years for the current northern glaciation, however. Antarctic cores from Vostok stopped at 414,000 years ago. There is a greater variety (and geographic distribution) of orchids than any other flowering plant -- on the order of 40,000 or 70,000 species. Orchids are found from the Arctic to the tropics. Grasses grow from the bottom, rather than the top, as other plants do. This is a biological solution to being grazed, just as trees attempted to move away from ground level. Most earlier plants had attempted to protect themselves by being tough and difficult to chew. Before grasses became well established, before the end of the Cretaceous (and the end of the age of the dinosaurs), when the wind blew dust was everywhere. It is these dust storms which have provided us with the fossils of that era. Sands and volcanic dust have piled up in some areas to depths of thousands of feet. The remains of animals covered in thick layers of wind-blown material cannot be destroyed by scavengers. After the spread of grasses the sedimentation rate dropped. It is one of the noted differences between the periods before and after the Cretaceous. We have found far fewer fossils from this later era. See Peter Douglas Ward, Gorgon: Paleontology, Obsession, and the Greatest Catastrophe in Earth's History (2004), which deals with the Permian land extinction of 250 million years ago. This is a personal account of ten years' research for clues to the causes in South Africa's Karoo Desert. And see also a more recent work by Douglas H. Erwin Extinction, How Life on Earth Nearly Ended 250 Million Years ago (2006). Erwin starts out by stating that he does not know the answer. At the end of the book, after reviewing a dozen theories, he still does not know. Oceanic floor spreading starts at about 180 mya in the Jurassic (started 200 mya). Robert Bakker, in The Dinosaur Heresies (1986), convincingly suggests dinosaurs were warm blooded, and also writes about the extinction of the dinosaurs, 65 million years ago, stating the rather startling fact that "sedimentation stopped" after this time. This was the time of the takeover of the soil by grasses. Bakker's claim about sedimentation started my search for the point in time between the two differing biologies that the Earth seems to have experienced. I checked the record of orogeny, at least for the American continent; it looks periodic as well. However, orogeny is more likely to be caused by an expansion of the Earth -- which is a whole different topic altogether. 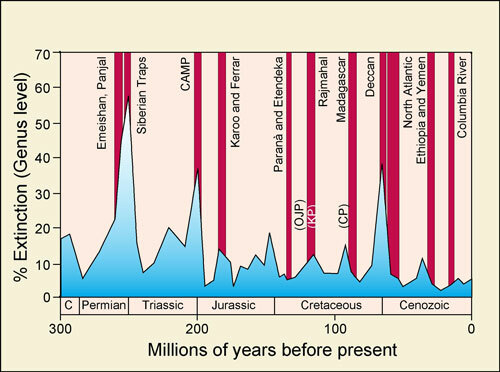 The expansion and the creation of the world's oceans dates from the Jurassic during which time the oldest ocean depressions were formed. See the Appendix "Changing Size of the Earth." The disappearances of the inland seas after the Permian is probably the result of a runoff to the much lower levels of the first true ocean depressions. I will assume that all the "lost planets" of Saturn ended up orbiting the Sun at close distances, the location Saturn reached as it swung about the Sun at perihelion -- perhaps something on the order of one-half AU. Mercury today orbits the Sun at 1/3rd AU; Venus orbits at about 2/3rd AU. For Earth an orbit at 1/2 AU would make the climate much warmer, but it would be moderated by the Earth's enclosing atmosphere. Niles Eldredge and Stephan J. Gould, "Punctuated equilibria: an alternative to phyletic gradualism" Annual Meeting of the Geological Society of America (1971). Also, Gould and Eldredge, "Punctuated equilibria: the tempo and mode of evolution reconsidered" Paleobiology (1977). The extent of the Sun's plasmasphere is estimated at a modest 100 AU. The formula in the text compares (for the Sun) half the circumference of a circle with a radius equal to 100 AU (which would represent the average size of an arc passing through the plasmasphere of the Sun), with (for Saturn) the circumference of a circle of 90,000-AU radius -- using a circle as an approximation of an elliptical orbit. Voyager I reached the edge of the Sun's plasmasphere (traveling 100 AU) in 26 years at 40,000 miles per hour (64,000 km/hr) -- more than its escape velocity from Earth (it was augmented by a swing around another planet). Saturn in its entry into the Solar System would not reach this speed soon. Its average speed along its 27,000,000-year path would be only 220 mph (350 km/hr). It would speed up in closing in on the Sun, but would not reach a speed of 40,000 mph (64,000 km/hr) until it almost reached the orbital distance of Mars from the Sun. The radius of the orbit of Saturn can be compared to the distance to the nearest star, Proxima Centauri, at 268,000 AU. Thus the (average) orbital diameter of Saturn's orbit is only about 70 percent of the distance to Proxima Centauri: (2*90) / (268) = 0.69. Proxima Centauri exists only as a single point in one location, somewhere in the sky. There are, by the way, some 32 stars within a distance of 950,000 AU (15 light years) from the Sun. It should also be realized that the orbital period is not affected by the eccentricity. And, secondly, that Kepler's third law is based on the long axis of the orbit, so that estimates of how far away from the Solar System Saturn would travel are numerically correct. The Chicxulub "impact crater" in the Yucatan (Mexico) is impressively large and circular (112 miles in diameter -- 180 km), but it is not an impact crater. It is surrounded with smaller perforations along the edge typical of any of similar anode burn marks elsewhere, such as the craters of the Moon. These are the cenotes (sinkholes) of the Northern Yucatan. Their circular pattern is clearly seen in satellite images. A gravitational anomaly mapping shows a ridge inside the complete ring of the "crater" which, of course, has led to the suggestion that the crater was formed by the impact of a smaller object only 6 miles in diameter. I'll suggest that the crater was made by a lightning bolt 112 miles in diameter. "Was the K/T boundary event the result of a single asteroid impact (causing the 200-300 km diameter Chicxulub crater in Mexico) or something more? We note the following points as evidence that it was something more:"
"The global set of craters Manson, Karn, Kamensk, Gusev, and another impact in the Pacific Ocean apparently all date from close to the same epoch. However, the diameter and abundance of quartz grains are larger in Western North America than elsewhere in the world, suggesting that the single largest impact was the Chicxulub event." "The K/T boundary consists of two distinct claystone layers, the upper (soot, iridium) one with shocked grains, the lower one without." "Gorceixite (altered tektites with swirl patterns) is segregated within each layer, suggesting that different impact events formed these glassy beads." "A single bolide impact cannot simultaneously explain the pattern of major floral extinctions on land and other extinctions at sea." "Sediments in Cuba range from 5 to 450 m thick, probably from a giant wave. The (upper) ejecta layer is 50 cm thick in nearby Haiti, far more than at any other site, suggesting a major impact within 1000 km, which would be far from the Chicxulub crater in Mexico." "The K/T boundary layer is apparently absent from the Antarctic regions. Just as for the Sun, planets spend up to six months continually below the horizon as seen from each polar region alternately. So the boundary event apparently affected the entire globe except for the south polar regions. This pattern suggests multiple impacts from an exogenous source over a period of at least one day." This accumulation of data starts to look more and more like a gigantic plasma strike followed by smaller strikes, "over a period of at least one day." By analogy from later and better-known events, I would suggest a period of seconds or minutes. Thunderbolts result in nearly circular "craters"; repulsive electric field impacts take a completely different form, last many minutes, and show the result of the Earth's rotation. Details of the results of a compressive electric force are developed in Chapter 9, "Event of the Younger Dryas," and Appendix B, "The Celestial Mechanics." Another likely sequence, which I will develop in the following chapter, is that Earth's connection to Saturn was at a lateral level before dropping below the south pole of Saturn. I estimate that this last process took from circa 10,900 BC to 3147 BC. Moving into the plasmasphere of Saturn, Earth would initially have received a massive electric field shock, followed soon by a thunderbolt from Saturn. It appears that the shock was repulsive, despite the fact that Saturn would be considerably more positive than Earth, which should have resulted in attractive forces. The shock would account for the cold period of the Younger Dryas between 10,900 BC and 9,000 BC, for the compressive shock would generate very high temperatures, and instantly incinerate forests and prairies. Micro-fine carbon (nanometer particles) would have entered the stratosphere, in effect casting Earth into an extended period of shade. I'll start the discussion of this in the chapter "Tunguska and Chicxulub." During this condition (being cast into darkness), Earth would have progressively relocated to further below the pole of Saturn, without any additional disruptive effects. Size of this page: 8146 words.